46% of the UK’s online shoppers are planning to leave their Christmas shopping until the last minute this year, despite the majority having little faith in the ability of retailers to deliver in time for the big day. This stat comes from an online Christmas shopping survey of 1,000 UK consumers carried out for Eptica, which also looked at how retailers were providing information on delivery. So what can retailers do to appeal to last minute shoppers and reassure them about delivery? The most obvious thing retailers can do is to ensure that orders arrive on time for consumers. 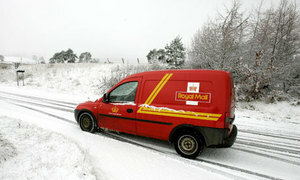 Of course, most retailers have to place their trust in couriers or the Royal Mail, or both. This means that the ‘last mile’ is often out of their hands. However, if orders don’t arrive on time, it isn’t the couriers that get the blame, it’s the retailer. In an Econsultancy / Toluna survey carried out in January, 28% of respondents said that they would not shop again with a retailer that failed to deliver on time. Of course, even with an efficient mail service and a reliable courier, the weather (or postal strikes) can always throw a spanner into the works, as it did last year. Retailers need to take every possible step to ensure that customers aren’t disappointed this year. 46% expect to leave gift shopping to the last minute, though expectations for delivery aren’t great. Just 33% expect that last minute orders will arrive on time. 40% don’t trust the retailer to deliver on time, but are willing to give it a go. 27% expect last minute orders to be late. These consumers clearly have pessimistic attitudes about delivery at this time of year, but are they justified? Well, according to a survey we carried out about Christmas delivery last year, these attitudes are understandable. The results suggest that here were a lot of disappointed customers last Christmas, with 26.24% receiving orders late, though the heavy snow in December can explain much of this. 57% of orders were just one day late, but a significant percentage have clearly had a terrible experience with late deliveries. Almost 20% of respondents experienced delays of more than a week on orders, and many presumably failed to arrive in time for Christmas. By comparison, 91% of retailers in Snow Valley’s 2010 Online Retail Delivery Report, which measured delivery at a different time of year, managed to keep to the promised timescales. Are online retailers keeping customers informed? Eptica looked at 40 ‘leading’ websites across a range of sectors, and found that 85% were not providing clear details of last order dates for Christmas. This is vital information, and will become more important to closer we get to Christmas. I’ve checked out a few e-commerce sites to see who is providing this information, and not many are doing so very clearly at the moment. However, this information wasn’t available (or at least I couldn’t find it) on Tesco, Next, and Amazon. It’s early days yet, but all retailers should be providing this information as Christmas day, and final delivery deadlines are closer. Last minute shoppers will need to be reassured about final delivery dates before they make a purchase. The countdown clock is a great way to convey this information, and also adds an extra sense of urgency for potential customers. Clear messaging is all the more important in the case of bad weather, as customers will arrive at your site wondering whether or not they can place on order for Christmas. From a retailer’s perspective, allowing customers to shop right up to the last minute is a great way to maximise sales, and to steal a march on competitors with earlier cut-off times. Whether or not their gifts will arrive in time for the big day is a key concern for customers. It’s far better to provide this reassurance clearly when they arrive at a website than to create doubts by not providing this info, or making them work too hard to find it. The handling of the chaos caused by the snow last year provided an interesting case study on how retailers manage customer expectations around delivery. In some parts of the country, the snow was so severe that retailers could simply not guarantee delivery, so there was a challenge to communicate this information clearly to customers. Some, such as John Lewis, decided on December 20th not to take any further orders for Christmas delivery. Under normal weather conditions the retailer could have had three more days to sell online, but better not to take orders than to disappoint customers. The key here is to manage expectations, provide clear information, and don’t promise what you can’t deliver. Durex is launching its first affiliate programme, aiming to support sexual education while providing information about its products. This coincides with a major brand push instore, as well as a targeted experiential marketing campaign. After days of speculation, Facebook has confirmed that it has hired Gowalla cofounders Josh Williams and Scott Raymond. The pair, who founded the location based social networking site in Texas, will move to California to join Facebook’s design and engineering team in January along with other Gowalla employees. Facebook said in a statement that it isn’t acquiring the Gowalla service or technology, but was sure that “that the inspiration behind Gowalla will make its way into Facebook over time”.